Who doesn’t love a big batch of Buffalo wings? 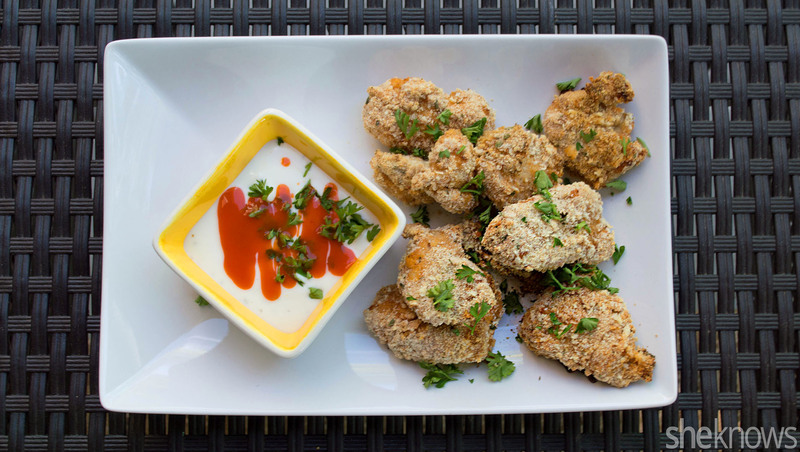 Those fried pieces of chicken dripping in spicy, hot, wing sauce, then slathered in ranch dressing… Sounds so good, right? While they are totally delicious, they aren’t very waistline friendly or super healthy. In this recipe, I made a much healthier version without sacrificing the wonderful flavors everyone loves. Rather than deep-frying the chicken, I baked bite-size pieces of chicken breast that I marinated in spicy wing sauce and ranch dressing. Giving the chicken a light coating in both Italian-style and panko breadcrumbs yields that crispy crunch, and a hearty grating of fresh Parmesan cheese adds an extra boost of flavor. 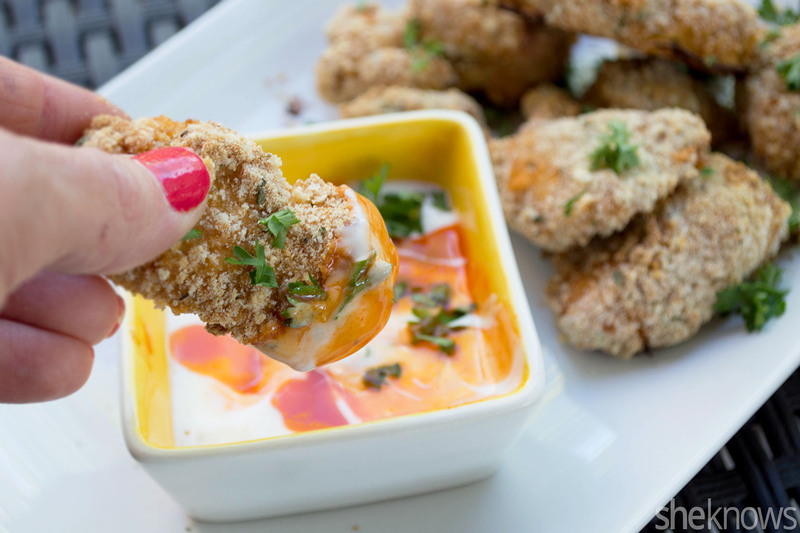 These spicy Buffalo chicken bites are great for satisfying your guilty pleasures without wrecking your diet or healthy eating habits. To make a healthier, low-calorie ranch dip, simply combine powdered ranch with a little bit of plain Greek yogurt and a drizzle of hot sauce on the top. 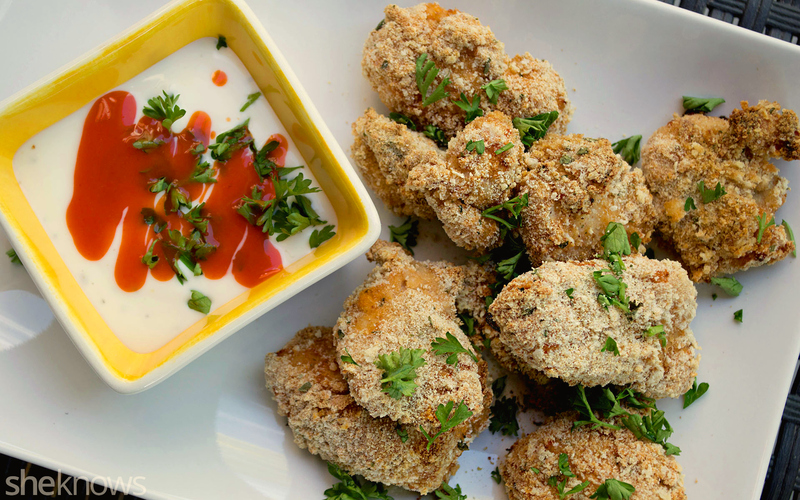 Chicken breast is diced and marinated in Buffalo sauce and ranch dressing, then coated in panko crumbs and baked until crispy, golden brown for a healthier take on wings. To a plastic zip-top bag, add the diced chicken, buttermilk ranch and the hot sauce. Close the bag, and shake to evenly coat all the chicken pieces. Chill for 30 minutes to marinate the chicken. Heat the oven to 375 degrees F, and line a baking sheet with parchment paper. To a larger bowl, add the panko breadcrumbs, Italian-style breadcrumbs, Parmesan cheese and seasonings, and mix well. Using tongs, carefully remove a few pieces of chicken from the bag, and drop them into the breadcrumb mixture, coating the chicken evenly. Repeat until all the chicken pieces are coated. Place the chicken in the oven, and bake for 20 minutes or until the chicken nuggets are crispy and a nice, golden brown color. Garnish with fresh chopped parsley, and serve warm with extra ranch dressing for dipping.